The Olympic and Britannic were the sister ships of the RMS Titanic. 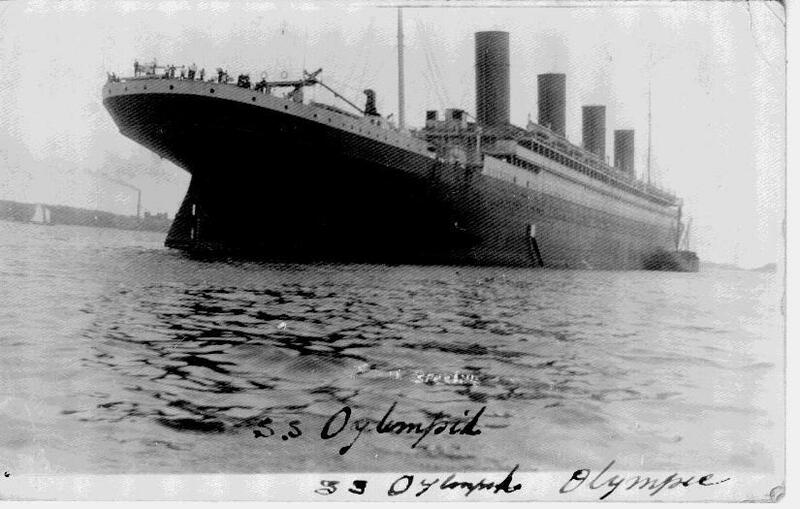 The Olympic was launched before the Titanic, and unlike her unlucky sister Titanic, which sank on April 14/15, 1912,She has a long and illustrious career, earning herself the nickname "Old Reliable". The third sister, Britannic, was not so lucky, and sank while serving as a hospital ship! 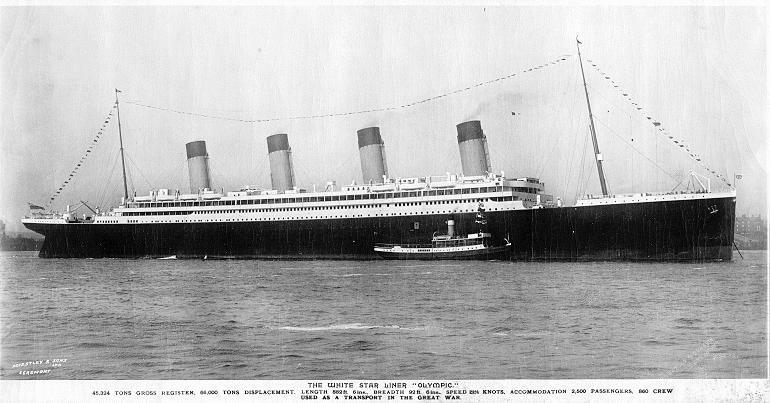 Built by Harland and Wolff -:- Maiden Voyage: Southampton - New York, 14 June 1911. Badly damaged in collision with cruiser H M S Hawke off Portsmouth, 20 September 1911. Extensively rebuilt after loss of sister Titanic in 1912. 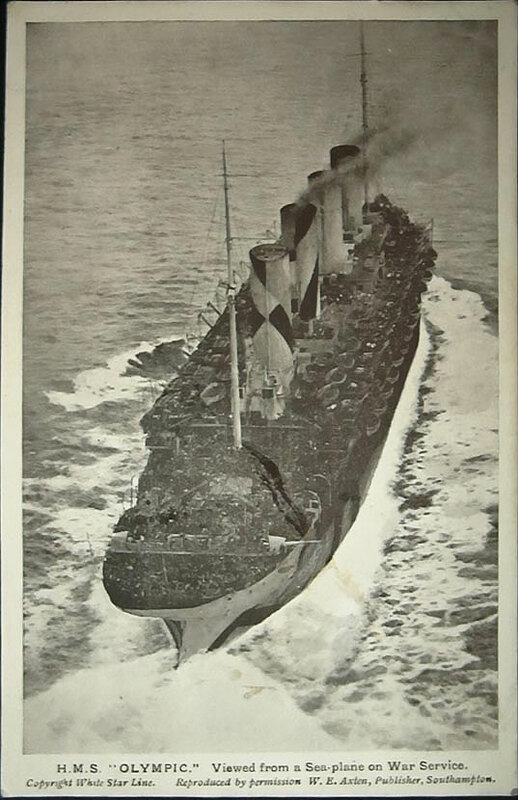 Converted to troopship September 1915. Rammed and sank the German submarine U-103, 12 May 1918. Resumed passenger service July 1920. Transferred to Cunard - White Star Line 1934. Towed to Inverkeithing for final demolition/scrapping 1937. The back of both cards indicate they were made in Canada, so it is possible both pictures show the Olympic while in or near Halifax. This postcard stern view of the Olympic is an interesting angle. Because of the number of lifeboats, this is a post Titanic disaster picture. 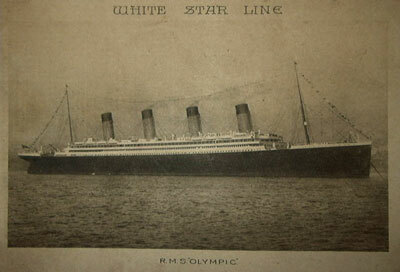 This picture shows that the Olympic and Titanic were certainly impressive Ships. (link to 88k jpg) This picture may have been taken in Halifax harbour, and is a great picture of the Dazzle Paint scheme beginning to peel and fade. She is probably still acting as a troopship in this photo as there are a large number of men lining the rails, and they appear to be wearing long army style trench coats. As a troopship, New York, Halifax, Liverpool and Southampton were her ports of call! 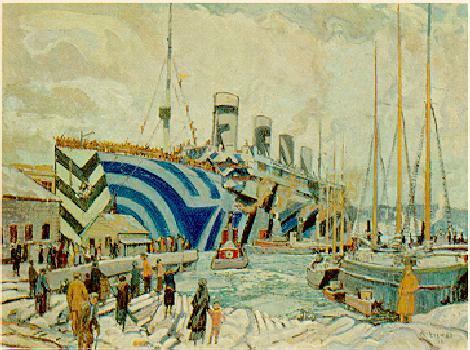 "The 'Olympic' with Returned Soldiers". This painting is in the collection of the National Gallery of Canada, Ottawa. I have been able to figure out the following war-time activities of the "HMT Olympic". First of all, it seems her designation during WWI was "HMT" or "His Majesty's Transport". I found this information in "Olympic&Titanic: Ocean Liners of the Past", and more specifically in the epilogue written by John Maxtone-Graham. 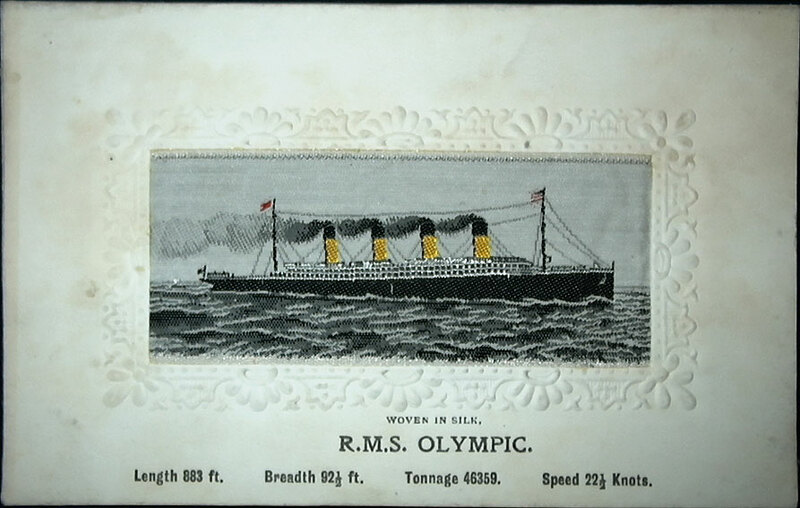 One postcard (shown above) also gives the designation "HMS" or "His Majesty's Ship"
Note: "RMS" means "Royal Mail Ship"
1914 Saturday August 8 after the declaration of war, The Olympic sailed, with no passengers, no mail and no cargo from New York to Liverpool. She was escorted part way by british cruiser HMS Essex, and was met by cruiser HMS Drake off the Irish coast. October 21 departs New York, 1600 passsengers. Oct 27, she was alerted by wireless that the battleship HMS Audacious had struck a mine. 250 of the 900 seamen were rescued by Olympic, with other british warships picking up the remaining crew (only 2 crew perished). Although the HMS Audacious was wallowing helplessly, with her stern awash, the Olympic attempted to take the Audacious in tow but the battleship could not be saved. November 2 after the rescue and tow attempt, Olympic anchors in Lough Swilly, her passengers not permitted to disembark until sworn to secrecy about the sinking. November 2 she sails to Belfast, where she is taken out of service for conversion to a troopship. This takes 10 months, during which she is fitted with a 12 pound gun forward, and a 4.7 inch gun aft. 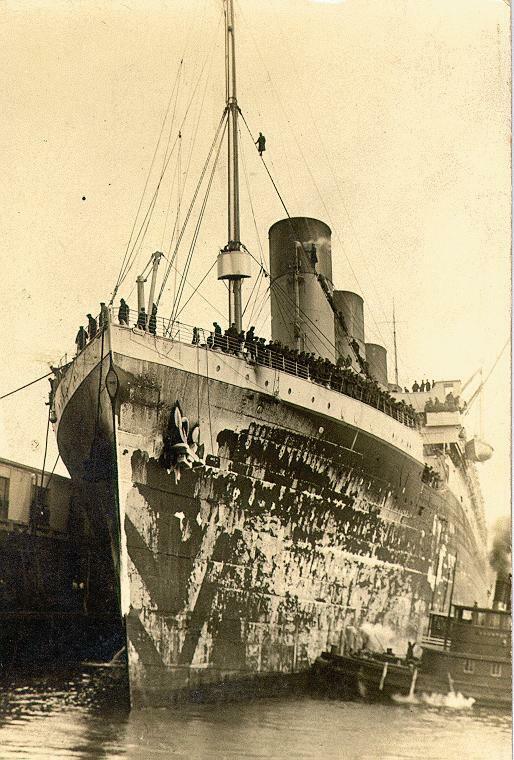 October 31 completes the above first troop voyage at Liverpool. March 23 departs on first of 10 round trips (20 crossings) to Halifax (from? Southampton or Liverpool?). June 27 departs Southampton for Halifax with 935 "registered" passengers. The passenger manifest shows hundreds of civilians, women and children, along with a separate list of soldiers etc., being returned for various reasons including "medically unfit" etc. July 4 2:30pm arrives in Halifax. Between 3pm and 5pm, Dr Morton examines the Salon Passengers. Between 5pm and 7pm he examines the Steerage. Clean bill of Health, no Quarantine required! July 12 departs New York City carrying US Army's 364th Infantry Division. July 19 arrives at Southampton. Aug 8 Boarding of the Olympic at Pier #57, New York is allowed. Aug 8-16 information provided by Jamie Cummins, June 2002. The details are in a letter written by her Great Grandfather, David Scott Cummins, to his sister in 1918. 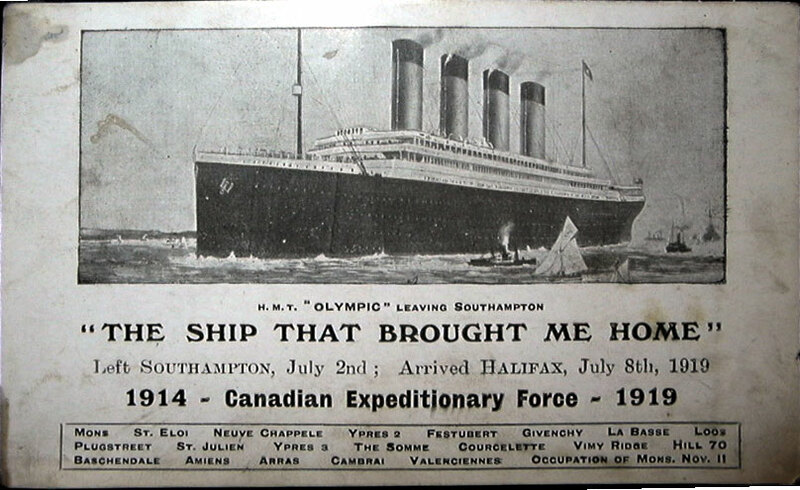 Leave Southampton carrying soldiers from the "Canadian Expeditionary Force"
2nd last trip as a troop ship! July 8 Arrive Halifax carrying soldiers from the "Canadian Expeditiionary Force"
1920 June 25 return to passenger service, at Southampton. This Website managed by Andrew Nash. Back to Andrew Nash Homepage.